I don’t think I need to tell you about our shopping patterns again….do I? Of course, we were out in Delta Township and it was lunch time. We weren’t in the mood to hunt out a sit down place and McDonald’s didn’t sound good either. I remember seeing a few months ago that Qdoba was moving into the space that used to be a Ya-Ya’s Chicken. That was a while ago, so I assumed it was open. I’ve only eaten at Qdoba once in my life. I used to work with a woman that loved it. She would have lived inside Qdoba if they would have let her. The closest one to us was forty minutes away, but if we were ever anywhere near it, I would have to take her for a burrito. Only once did I actually eat lunch with her. I wasn’t impressed, but I wasn’t turned off either. 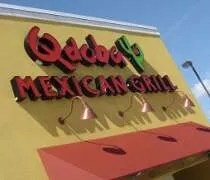 The newest Qdoba in the Lansing area is on Saginaw Highway across from the Lansing Mall. Parking around the building isn’t great. The entrance is actually on the side of the building and there are a few angled parking spots there. If there’s a lot of traffic in the area of that strip mall, finding a close spot could be a challenge.